Analysis: Burkhead out-touched James White by five carries, serving as Sony Michel's primary backup and making a pivotal 26-yard run on the game-clinching drive. The versatile veteran struggled during the 2018 regular season, averaging just 3.3 yards per carry while dealing with a neck injury and sharing time with both Michel and White. However, Burkhead is on the books for a modest $3 million in 2019, so he has a good chance to hang on to a roster spot next season. Analysis: Burkhead was outplayed by Sony Michel and James White on the ground, with both of those alternatives gaining more rushing yards and scoring a touchdown apiece. 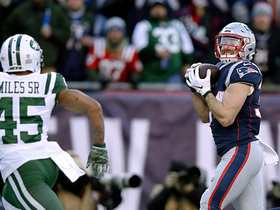 While Burkhead was New England's receiving option of choice out of the backfield this time, it wouldn't be surprising to see him cede more opportunities to White against the Jets in Week 17, as both guys possess similar skill sets while Michel is the most talented pure rusher of the group. Analysis: Burkhead was once again out-snapped Week 15 by both James White (25) and Sony Michel (23). In that timeshare context, Burkhead adds depth and versatility to New England's backfield, but he isn't a reliable fantasy option. Analysis: Burkhead was out-snapped by both Sony Michel (34) and James White (33), a trend that figures to continue as long as his backfield counterparts remain healthy. In his current complementary role, Burkhead isn't a reliable fantasy option, but his return to the mix adds valuable versatility and stretch run depth to New England's ground game. In his first game back since returning from IR, Burkhead logged 17 out of a possible 74 snaps on offense in Sunday's 24-10 win over the Vikings, en route to carrying seven times for 20 yards and hauling in both of his targets for 21 yards. Analysis: Meanwhile, James White received 33 snaps and a team-high seven catches, while Sony Michel saw action on 30 snaps and led the team with 17 carries. Burkhead's versatility will lead to his share of touches each week, but at this stage Michel is the team's preferred early-down option and White is a big part of the passing game. That may not leave enough looks for Burkhead to be a reliable fantasy option, but keep in mind that he is one backfield injury away from relevance on that front. Burkhead is active for Sunday's game against the Vikings, Ben Volin of The Boston Globe reports. Analysis: In his return to the mix in Week 13, Burkhead figures to work behind top back Sony Michel and pass-catching ace James White. While the versatile Burkhead is likely to be eased back into the New England backfield initially, in the coming weeks he could carve out enough of a role to merit deep-league consideration down the NFL stretch run. Burkhead (neck) has been activated off IR in advance of Sunday's game against the Vikings, Field Yates of ESPN reports. Updating a previous report, Burkhead (neck) made an appearance at Tuesday's practice, according to Jim McBride of The Boston Globe. Burkhead (neck) wasn't present for the Patriots' practice Tuesday, Kevin Duffy of the Boston Herald reports. Burkhead (neck) returned to practice Thursday, Mike Reiss of ESPN.com reports. 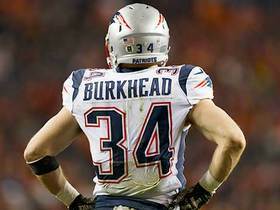 The Patriots will place Burkhead (neck) on injured reserve Wednesday, Jim McBride of The Boston Globe reports. Burkhead, who was evaluated for a neck injury in the second half of Sunday's loss to the Lions, did not return to the game, Kevin Duffy of the Boston Herald reports. Burkhead is questionable to return to Sunday's game against the Lions due to a neck injury. Analysis: Burkhead exited the game in the third quarter without seeing a carry, though he did contribute two receptions for 26 yards through the air. In his absence, Sony Michel will continue to handle the majority of between-the-tackles work while James White steps in on passing downs. Burkhead (concussion) rushed six times for 22 yards and wasn't targeted in the passing game during Sunday's 31-20 loss to the Jaguars. Analysis: New England is notoriously inconsistent with its running back usage, but things didn't look good for Burkhead in Sony Michel's (knee) debut. Michel got a team-high 10 carries and was targeted twice while James White caught seven of eight targets and added four carries. If Michel handles most of the rushing duties moving forward and White serves as the receiving back, that doesn't leave much of a role for Burkhead. Burkhead (concussion) is listed as active Sunday against the Jaguars. Analysis: Meanwhile, Sony Michel (knee) will make his season debut Sunday, with James White on hand to work in a change-of-pace/pass-catching role. While Michel's availability figures to cut into his workload, Burkhead still seems likely to head the team's Week 2 backfield committee. Burkhead (concussion) is "likely to play" Sunday against the Jaguars, Adam Schefter of ESPN reports. Analysis: Per the report, Burkhead still needs to get through pre-game warmups without any setbacks, but it looks like he'll give it a go Sunday. Meanwhile, Sony Michel (knee) is expected to make his season debut Sunday, and in a scenario where both backs play, he's a threat to cut into Burkhead's Week 2 workload. Burkhead (concussion), who is listed as questionable for Sunday's game against the Jaguars, made the trip with the team to Jacksonville, Jeff Howe of The Athletic reports. Burkhead (concussion) is listed as questionable for Sunday's game against the Jaguars. Burkhead (concussion) was officially a limited practice participant Thursday. Analysis: Burkhead missed practice Wednesday, so that's a step in the right direction. That said, unless the running back is medically cleared and able to practice fully Friday, he'll probably draw a "questionable" injury designation for Sunday's game against the Jaguars. Burkhead (concussion) was spotted at practice Thursday, but appeared "limited at best," Jim McBride of The Boston Globe reports. Analysis: That Burkhead was on the field at all after missing Wednesday's session is a good sign, but the extent of his involvement won't be known until the Patriots reveal their practice report later Thursday. Though he was listed as a non-participant Wednesday, Burkhead was donning pads while taking part in individual drills, according to Phil Perry of NBC Sports Boston. That suggests that Burkhead may have advanced beyond the initial phase of the NFL's concussion protocol. Burkhead didn't practice Wednesday after entering the concussion protocol. Analysis: This bit of news comes out of nowhere, but Burkhead's status now needs to be monitored closely in advance of Sunday's game against the Jaguars. With Jeremy Hill (knee) on injured reserve and James White not ideally suited for three-down work, first-rounder Sony Michel (knee/limited) could be unveiled by the Patriots this weekend if he's deemed fit to play by the team. Burkhead carried the ball 18 times for 64 yards and added a 5-yard catch during Sunday's 27-20 win over Houston. With Sony Michel (knee) inactive Sunday, Burkhead, James White and Jeremy Hill will handle the Patriots' backfield duties in Week 1, the team's official site reports. Analysis: The Patriots' carry distribution tends to be matchup or game-flow dependent, but look for the versatile Burkhead to handle a decent portion of the team's rushing touches Sunday. Meanwhile, White figures to garner his share of passing targets in Week 1 and Hill could see some opportunities in short-yardage situations. Of the three, Burkhead seems likely to handle the most touches, so long as he avoids any setbacks with the knee issue that he dealt with during the preseason. Though ESPN's Mike Reiss has suggested that Burkhead might be eased into action in Week 1, given that he's bouncing back from knee issues, NESN's Doug Kyed expects Burkhead "to get a heavy workload as the Patriots' "top ball-carrier in Week 1." Though Burkhead is not listed on the Patriots' Week 1 injury report, Mike Reiss of ESPN.com suggests that the running back could "be eased into the mix because there is an acclimation process that still needs to take place." Burkhead (knee) wasn't listed Wednesday on the Patriots' Week 1 injury report. 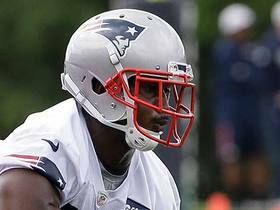 Burkhead (knee) and Sony Michel (knee) are participating in position drills at Sunday's practice, Mark Daniels of The Providence Journal reports. Analysis: Burkhead reportedly suffered a slight knee tear in the first or second week of August, shortly after Michel had a procedure to drain fluid from his own injured knee. Recent reports suggest the Patriots expect Burkhead to play Week 1 against the Texans, while Michel's status is somewhat murkier. With Mike Gillislee, Brandon Bolden and Ralph Webb all failing to survive cutdown day, James White and Jeremy Hill are the only healthy running backs on the roster as of Sunday afternoon. Jeff Howe of the Athletic relays that there has "been a constant sense of optimism" with regard to Burkhead's (knee) Week 1 availability. Burkhead (knee) isn't in line to play in Thursday's preseason finale against the Giants, Mike Reiss of ESPN.com reports. Burkhead (knee) isn't expected to play in Friday night's preseason game against the Panthers, Mike Reiss of ESPN.com reports. Analysis: The same applies to fellow running back Sony Michel (knee), though it's important to note that Burkhead appears closer to being cleared for game action than his rookie teammate, considering that he has already returned to the practice field on a limited basis. Burkhead (knee) was present for practice Tuesday, but didn't participate in positional drills at the beginning of the session, the Kevin Duffy of the Boston Herald reports. Burkhead (knee) returned to practice Sunday, Doug Kyed of NESN.com reports. Analysis: Burkhead missed Thursday's preseason tilt against the Eagles due to a minor tear in his knee, but he was able to return for Sunday's scheduled walkthrough. Burkhead could handle a good chunk of the early down work with Sony Michel currently sidelined (knee), but the latter isn't expected to miss much, if any, of the regular season. Burkhead is dealing with a slight tear in his knee, Jeff Howe of The Athletic Boston reports. Analysis: Apparently, the tear is minor enough that Burkhead would be playing through it were this the regular season. But this explains his recent absence in camp at least. Jeremy Hill and the injured Sony Michel (knee) are Burkhead's competition for snaps on early downs, while James White will see more work as a receiver out of the backfield. Burkhead (undisclosed) was not present for warmups prior to Thursday's preseason game against the Eagles, Doug Kyed of NESN.com reports. Analysis: The running back's next opportunity to suit up will thus arrive in next Friday's exhibition tilt against the Panthers. Burkhead (undisclosed) isn't expected to suit up in Thursday's preseason tilt with the Eagles, Mike Reiss of ESPN.com reports. Burkhead (undisclosed) isn't practicing Monday, Mark Daniels of The Providence Journal reports. Analysis: Burkhead was first reported to be dealing with an injury Wednesday and was subsequently held out of Thursday's preseason win over Washington. He hasn't practiced since that game, leaving his status in question for Thursday's exhibition against the Eagles. With Sony Michel (knee) set to miss the game, New England figures to split carries between Jeremy Hill, Mike Gillislee, Ralph Webb and Brandon Bolden. Burkhead spent part of Wednesday's practice on a rehab field, Ryan Hannable of WEEI.com reports. Analysis: A full-practice participant up to this point, Burkhead took part in the beginning of Wednesday's walkthrough before moving to a side field that's typically reserved for injured players. While there's no indication of a serious injury, he seems unlikely to play in Thursday's preseason game against Washington. ESPN's Mike Reiss suggests that Burkhead is "more likely to get the initial nod" over first-rounder Sony Michel this season, in terms of goal-line duty. First-round draft pick Sony Michel is slated to join Burkhead in the Patriots' 2018 backfield. Burkhead's three-year contract with the Patriots contains $5.5 million fully guaranteed, including all of his $1 million base salary for 2018 and $1.5 million of his $1.75 million base salary for 2019, Ben Volin of The Boston Globe reports. Burkhead has signed a three-year deal to remain with the Patriots, Ian Rapoport of NFL Network reports. Burkhead can become an unrestricted free agent Wednesday when the league year begins, ESPN.com's Mike Reiss reports. Burkhead carried three times for 18 yards and hauled in his only target for 46 yards in Sunday's 41-33 loss to the Eagles in Super Bowl LII. Analysis: Burkhead logged nine offensive snaps (of a possible 76) Sunday, while James White recorded 45 and Dion Lewis was out there for 21. During the regular season, Burkhead recorded 64 carries for 264 yards and five TDs, while catching 30 passes for 254 yards and three TDs in 10 games. 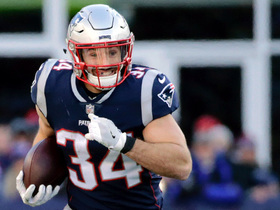 The 27-year-old is eligible to become a free agent this offseason, but we suspect that the Patriots would like to keep the versatile Burkhead around, at the right price. Burkhead (knee) rushed once for five yards and failed to bring in his only target in Sunday's 24-20 AFC conference championship game victory over the Jaguars. Burkhead (knee) is active for Sunday's AFC championship game versus the Jaguars. Analysis: Returning at the perfect time, Burkhead's first appearance since Week 15 coincides with a potentially compromised Tom Brady. If the signal caller's hand injury forces a game plan focused on the ground game and short passes, Burkhead could be in line for a busy day. Granted, Burkhead will be rotating into a backfield with starter Dion Lewis and multi-purpose RB James White, but any of the trio is a candidate to prosper. Burkhead (knee) is on track to play in Sunday's AFC championship game against the Jaguars, ESPN.com reports. Analysis: In his expected return to action following a three-game absence, Burkhead is in line to be part of the team's running back rotation Sunday, working behind lead back Dion Lewis. Burkhead will provide the team with another viable pass-catching option out of the backfield to go with change-of-pace man James White. Burkhead (knee) is listed as questionable for Sunday's AFC championship game after practicing in a limited fashion all week. Analysis: Earlier this week Ian Rapoport of NFL Network noted that Burkhead is expected to return to action this weekend after missing last Saturday's win over the Titans. 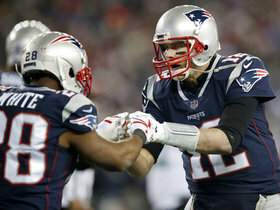 If Burkhead does indeed suit up against Jacksonville, he'd provide valuable depth behind lead back Dion Lewis, as well as another viable pass-catching offense out of the Patriots' backfield, which also includes change of-pace man James White and possibly Mike Gillislee (knee), who the team lists as questionable for Sunday's contest. Burkhead (knee) was limited at Wednesday's practice. Analysis: Ian Rapoport of NFL Network previously relayed that Burkhead is expected to return to action for Sunday's playoff game against the Jaguars. In such a scenario, Burkhead would add valuable depth to the Patriots backfield, while working behind lead back Dion Lewis. Moreover, Burkhead's versatility is a plus, given that besides being an option when Lewis needs a breather, he's also another back -- along with James White -- for the team to deploy in its passing game. Burkhead (knee) is expected to be available for Sunday's AFC title game against the Jaguars, a source informed Ian Rapoport of NFL Network. Burkhead (knee) is listed as inactive Saturday against the Titans. Analysis: Burkhead was unable to take advantage of the Patriots' first-round bye, missing his third consecutive game in the process. With Mike Gillislee (knee) also on the inactive list, New England's backfield will be the domain of Dion Lewis and, to a lesser extent, James White. Burkhead (knee) is not expected to play in Saturday's tilt against the Titans, Adam Schefter of ESPN reports. Analysis: Burkhead was deemed questionable heading into the weekend, but it does not look like he has been able to recover in time. With Mike Gillislee (knee) expected to be sidelined, expect Dion Lewis and James White to handle the bulk of the work out of the backfield. A final decision on Burkhead's status will likely be revealed when the Patriots release their inactives prior to the game. Burkhead (knee) is listed as questionable for Saturday's playoff game against the Titans after practicing in a limited fashion Thursday. Analysis: The same applies to both James White (ankle) and Mike Gillislee (knee). The Boston Herald relays that Burkhead appeared to be favoring his knee some at practice this week, so even if he is active Saturday, Burkhead could be limited in his return to action, while working behind the team's backfield leader, Dion Lewis. Though Burkhead resumed practicing Tuesday in a limited fashion, the running back is still "heavily favoring" his left knee, Jeff Howe of the Boston Herald reports. Analysis: At this point in the week, Burkhead, who missed the final two games of the regular season, continues to sport a brace on his balky knee. It's still expected Burkhead will be available for Saturday's divisional-round game against the Titans, though he could be limited some in such a scenario. Meanwhile, fellow running back James White (ankle) is also limited at practice this week, while Mike Gillislee (knee) missed his second straight practice Wednesday. Burkhead (knee) practiced in a limited fashion Tuesday. Burkhead (knee) was on the field for the start of practice Wednesday, Jeff Howe of the Boston Herald reports. Burkhead (knee) has been ruled out for Sunday's game against the Jets, Mike Reiss of ESPN.com reports. 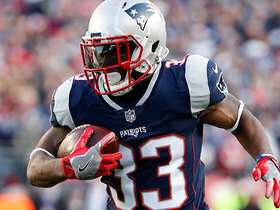 Analysis: Mike Gillislee (knee) will also be sidelined, so look for Dion Lewis to lead the team's Week 17 backfield, with James White (ankle) appearing on track to return to action Sunday in a change-of-pace role. In addition, versatile special-teams ace Brandon Bolden will be on hand to work in a reserve role. Burkhead (knee) did not suit up for Friday's practice, Zack Cox of NESN.com reports. Analysis: Burkhead has not practiced at all this week, so signs are pointing toward him missing a second straight game Sunday. His official Week 17 status will be revealed when the Patriots release their final injury report of the week. Burkhead (knee) did not practice Thursday, Jeff Howe of the Boston Herald reports. Analysis: Burkhead continues to trend toward inactive status for Sunday's game against the Jets. Meanwhile, fellow running back Mike Gillislee (knee) has also missed back-to-back practices. Added clarity on the Patriots' Week 17 backfield composition should arrive upon the release of Friday's injury report, with James White, who missed Week 16's game with an ankle injury, working in a limited fashion this week. Burkhead (knee) remained sidelined at practice Wednesday, Jeff Howe of the Boston Herald reports. 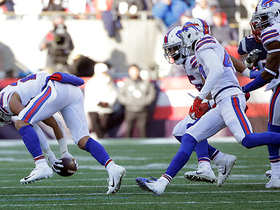 Analysis: Burkhead sat out the Week 16 win over the Bills and doesn't seem especially likely to return to action Sunday against the Jets. At this stage, the Patriots haven't ruled Burkhead out for their regular-season finale, but the team is primarily concerned with getting the 27-year-old back in time for its postseason run. Dion Lewis, James White and Mike Gillislee look primed to comprise the Patriots' backfield in Week 17. Burkhead (knee) has been ruled out for Sunday's game against the Bills, Mike Reiss of ESPN.com reports. Analysis: With Burkhead officially ruled out this week, look for Mike Gillislee (a healthy scratch last weekend) to be active Sunday for the first time since Oct. 29. If that happens as expected, Gillislee would join a backfield committee that also includes lead back Dion Lewis and, health-permitting, change-of-pace option James White, who is listed as questionable for Sunday's contest with an ankle injury. Burkhead (knee) remained sidelined at Thursday's practice, Mike Reiss of ESPN.com reports. Analysis: Look for Burkhead to be either listed as doubtful or ruled out for Sunday's game against the Bills once the Patriots release their final Week 16 injury report. In the event that Burkhead is ruled out, we'd expect Mike Gillislee (a healthy scratch in Week 15) to be active this weekend for the first time since Oct. 29, joining a backfield committee that also includes lead back Dion Lewis and change-of-pace option James White. Burkhead (knee) was not spotted at practice Wednesday, Mike Reiss of ESPN.com reports. Analysis: The Patriots haven't officially ruled Burkhead out for Sunday's game against the Bills, though some reports suggest that the running back might be held out until the postseason. If that plausible scenario ensues, look for Mike Gillislee (who was a healthy scratch in Week 15) to be active this weekend for the first time since Oct. 29. 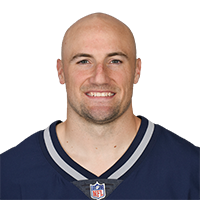 The MRI that Burkhead underwent Monday revealed the running back is dealing with a sprained left knee, Ian Rapoport of NFL Network reports. The Patriots are optimistic Burkhead will be ready to play in the postseason. The Patriots believe Burkhead suffered a knee sprain and a bruise in Sunday's 27-24 win over the Steelers, potentially setting him up to return for the playoffs, Ian Rapoport of NFL Network reports. Initial tests suggest Burkhead (knee) avoided a major injury, Adam Schefter of ESPN reports. Burkhead was forced out of Sunday's game against the Steelers with a knee injury. Analysis: Prior to his exit, Burkhead logged four carries for 12 yards and a touchdown while adding a catch for five yards. His absence leaves more snaps and touches for Dion Lewis and James White, and the team can dust off Mike Gillislee -- who was a healthy scratch Sunday -- if Burkhead misses time beyond Week 15. Burkhead rushed five times for eight yards and a touchdown in Monday night's 27-20 loss to the Dolphins, when he also caught all five of his targets for 45 yards. Burkhead rushed 12 times for 78 yards and two touchdowns while also bringing in three of four targets for 25 yards in Sunday's 23-3 win over the Bills. Burkhead rushed 13 times for 50 yards and a touchdown and brought in both of his targets for three yards and another score in Sunday's 35-17 win over the Dolphins. Burkhead was on the field for 19 of a possible 60 snaps on offense in Sunday's 33-8 win over the Raiders, ESPN's Mike Reiss reports. Burkhead, who logged 36 out of a possible 70 snaps on offense, carried 10 times for 36 yards and caught all three of his targets for 27 yards and a TD in Sunday's 41-16 win over the Broncos. 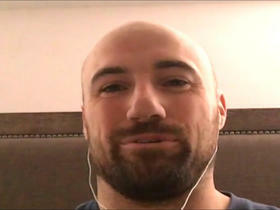 New England Patriots running back Rex Burkhead joins "NFL Total Access" to talk about his team's Super Bowl LIII win, playing with quarterback Tom Brady and more. New England Patriots quarterback Tom Brady finds running back Rex Burkhead over the middle and he races away for 25 yards. 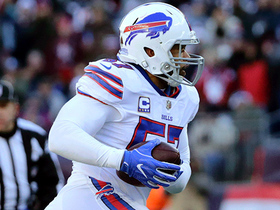 Buffalo Bills linebacker Lorenzo Alexander jumps in front of a pass thrown by New England Patriots quarterback Tom Brady for an interception. 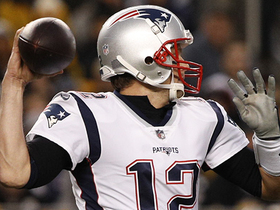 New England Patriots quarterback Tom Brady becomes the fourth player in the NFL with 70,000 career passing yards on an 8-yard pass to his running back Rex Burkhead. NFL Network Insider Ian Rapoport breaks down who has the edge in the New England Patriots' running back competition. NFL Network's Terrell Davis discusses why the New England Patriots have the better running backs going into tonights Super Bowl matchup against the Philadelphia Eagles. NFL Network's Terrell Davis breaks down which New England Patriots running back can best exploit the Philadelphia Eagles in Super Bowl LII.